I went to Yorkshire Sculpture Park for a few hours today. Took a bag full of Pentax kit and the iPhone. I love using the iPhone. If only you could control focus and exposure – it would be even better. I came back with just short of 400 shots. I saw some new sculptures today by Joame Plensa – I’ve uploaded one to the gallery – Spiegel, 2010. His work is fascinating top look at, and photograph. Well worth a trip over if you like sculptures. 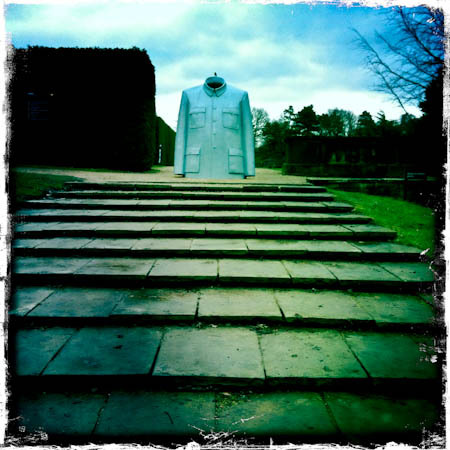 This one is by Chinese Artist Sui Jianguo, it’s a representation of the tunic worn by Chairman Mao. As I approached I spotted a robin perched on top looking at me. I took this photo with the iPhone and then proceeded to get my Pentax out. It had the 12-24mm on and I needed to switch to the 80-320mm as I unmounted the lens (quietly) the robin flew off. Missed a good one! « Photo365 – Day 355 – Scooby, where are yooooou?